Some of us have piles of “materials” laying in our back yards, materials such as scrap steel – long pieces, short pieces, pieces of all kind. These piles sit around our places, until the day arrives where we find a need to build something for our use that we cannot buy in a store. In my case, the need for a sawmill became stronger and stronger. Up to this point, I was able to cut logs with my Alaskan sawmill, which did a perfect job. The only drawback was the initial setup time, which was very time consuming, so I went back to the drawing board. The track system: I used 1 ½” angle iron x 12” welded on top of 3” U-channel for one side. For the other side I used the 3” U-channel only. In between the two tracks, I welded 1 ½” angle iron and ½” x 18” x 8” steel plate on top of it, on which the log will be resting. On one end of the steel plate I welded 3/4” tubing in which a 1/2” steel piece can slide to any height to prevent the log from rolling off. Frank Vanderveur's Sawmill. Note how the wedge is being used. Now the log dogs had to be made. Here there are many options to choose from. I kept it simple with two ½” x ¾” x 3” pieces of steel functioning as legs, which slide over the steel plate. These two legs are welded on either side of another ½” x ¾” x 3” piece of the same material in between. This middle piece has a sharp point grinded to the end that can be pounded in the log with a hammer. I know there are much nicer log dogs available, but this works fine for now. The frame in which the chainsaw is mounted: I had some stakes left from a flatbed that was not going to be used. These are excellent materials to use for building a rectangular frame, one for each side connected with the same tubing material on the top of each frame. Now this is where we have to watch out for – make sure that it is braced while you weld it together, otherwise the heat can bend it slightly and then your wheels won’t run on the track. I had the wheels fabricated by a local welding shop. They were made out of aluminum with a groove cut in the middle so two of the wheels on one side will slide over the angle iron piece and prevent the frame from rolling off the track. On the other side of the frame, I positioned one wheel [not as seen on this picture which has four]. In this case, it is easier to adjust the level of the frame than using two wheels. To mount the chain saw with a 48” bar I welded a frame together that glides inside the existing frame. This inside frame can be adjusted for height by ¾” threaded rod that turns inside a nut which is welded on this frame. It is very important that the chainsaw bar is perfectly level in place. If not, your bar will cut downward through your tracks all the way to China. To beef up the bar, I placed a ¾” threaded rod through the bar near the nose for more stability. This bar came from my Alaskan sawmill and is about 48” long. I have used this saw mill for cutting stair treads. It has really saved me some time. I can do 16 stair treads in two hours, including setup time. 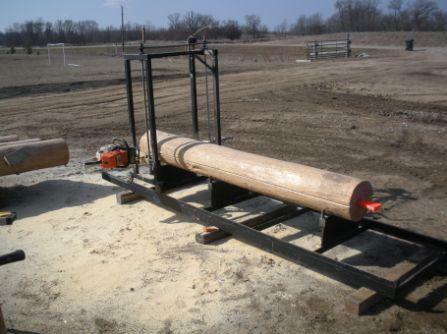 It is not a high production saw mill, but it works well for cutting logs in half. You have the option to make more tracks and cut longer logs. 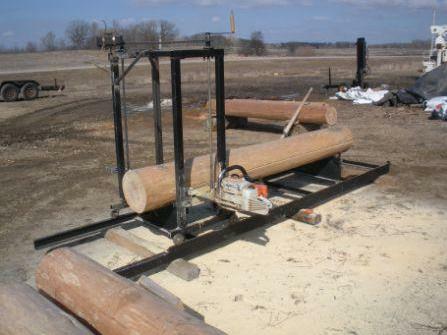 The sawmill is easy to transport on a 16‟ trailer and assemble on the jobsite. Above all, you got full use out of your metal scrap piles. I know a board member who has one of these very valuable “piles” in his backyard – and still makes use of them as I do! 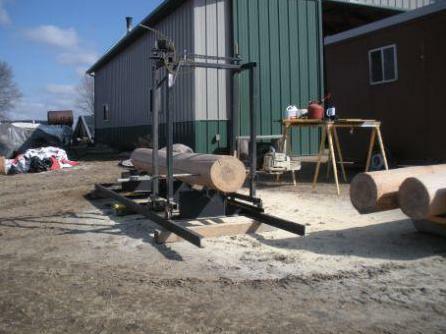 This entry was posted in Frank Vanderveur, Log Building Tips, Tools and Jigs and tagged tools. Bookmark the permalink. I want to build one for myself now! I built a jig for piece en piece log wall panels out of steel tubing. Works great. I have photos of it at http://logfrogs.com/2012/02/29/piece-en-piece-option-for-short-logs/ for anyone interested.